Genuine Manassa Turquoise set in Sterling Silver Bracelet. 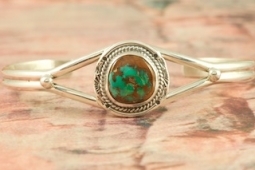 This Turquoise is also referred to as King's Manassa Turquoise. The Manassa Turquoise mine is located in Manassa, Conejos County, Colorado. Created by Navajo Artist Collier Nelson. Signed by the artist.